Horizon Hobby is one of the largest hobby RC plane distributors in the World. Specializing in RC airplanes, RC cars and RC boats. Horizon is a hobby RC plane distributor, servicing hobby shops in more than 50 countries, around the world. The range of hobby items offered is truly mind boggling! RC cars and RC boats as well as trains are available. Also all the parts needed to service and repair models can be shipped to RC hobby stores. As modelers, we can also buy direct from Horizon. The company is owned by the employees. Nearly 700 people are employed and product expertise and customer service are a major company objective. Some of the brands you will recognize are Parkzone, Hobbyzone, Hangar 9 and E-Flite. All types of models are available, from the finest RC electric planes. to glow and gas powered, aerobatic and scale RC planes, as well as beginner RC airplanes. For a look at their web site-click here. Parkzone are all RC electric planes and are complete and ready to fly, all foam (usually injection molded) electric powered model airplanes. Hobbyzone are also electric RC airplanes, that are finished and ready to fly, but all the models are beginner RC airplanes. and of the ARF type. Construction is generally of balsa and ply and covering is UltraCote. 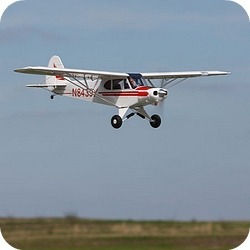 E-Flite are all electric model airplanes and generally of the ARF type. Construction is usually of balsa and ply, but a few foam models are also available. ARF or Almost Ready to Fly. These models require some basic assembly and installation of all the radio gear and outrunner brushless motor or RC gas engine or maybe a glow engine. This type requires the most skill to assemble and more information is available on this page- How to assemble RC model airplanes from an Almost-Ready-to-Fly (A-R-F) kit. BNF or Bind and Fly. This type is usually equipped with a 2,4GHz receiver and everything is included apart from an RC transmitter. PNP or Plug and Play. Similar to the BNF except no receiver or battery and charger are included. RTF or Ready To Fly. This kit contains everything, including an RC transmitter.